It's no secret I'm a big fan of just about anything Retrontario uploads to YouTube. He just uploaded an ad for CKEY Radio 590. It's from 1980, years before CJCL / FAN 590 took the spot on your dial. Today, that ad would be seen as promoting 590 as LGBT-friendly. Something for 103.9 PROUD-FM, perhaps. It turns out "Listen to the Rainbow" was CKEY's tagline for a while. Here's a poster from the days they promised "Good music, nice people and solid news". I think 103.9 PROUD-FM should license this campaign! 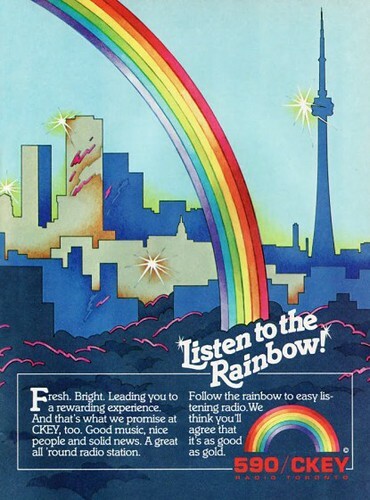 Ah, the good ole days when 'rainbow' meant something positive. Nope... not gonna bite.... not this time.